← Natural Garden Snail Elimination without Chemicals or Traps Review — Does it Work? Repairing Scratched Hardwood Floors with Walnuts Review — Does it Work? Solid hardwood floors are a beautiful part of many older homes (and some new ones too). Their patterns and colors are visually appealing and add a character to your living space that cannot be matched by carpet. Unfortunately, they can get scratched all too easily. When scratches occur you can fix them the hard way, or you can quickly erase them with raw walnuts! Last weekend while moving some furniture, my husband accidentally scratched the hardwood floor. It was a light scratch, but long and right in the middle of an open space. It was pretty noticeable. I had heard that raw walnuts could be used to “erase” scratches from hardwood floors. I pulled some walnuts from our pantry and started scrubbing one into the scratch. I was shocked as I watched the scratch practically disappear!! Before and after rubbing with raw walnut meat. This image was not photoshopped other than to place images side by side. 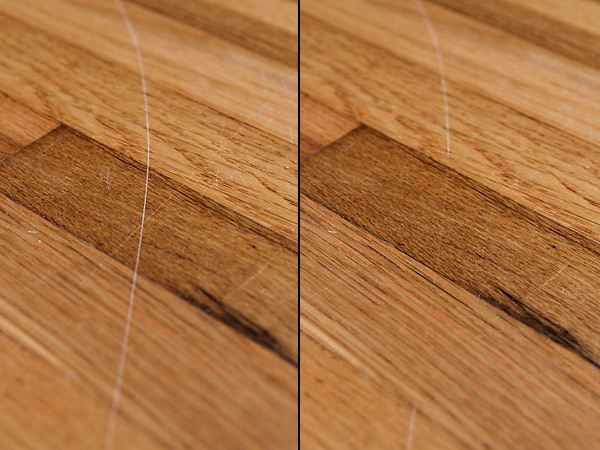 We easily “erased” all the scratches we could find on our living room floor. The scratches were still there, but very difficult to see, and only if you knew exactly where to look. Even when looking at the right spot, it took me 10 seconds of searching to find one. Then I noticed the floor had a little dirt on it from one of the kids shoes. I took a wet paper towel and rubbed it right over the repaired scratch. Even with a wet wipe-down it didn’t come back. I imagine the scratch might re-appear with some soap and serious scrubbing, but another walnut would easily fix it again. I also successfully used this technique on a dining room table scratch. It did not work well on some deep gouges that were in another room from a previous tenant, so there are some limitations to this method. However, I am quite pleased with the results we saw: with very little work, and for a very small price the scratches and scuffs are GONE! 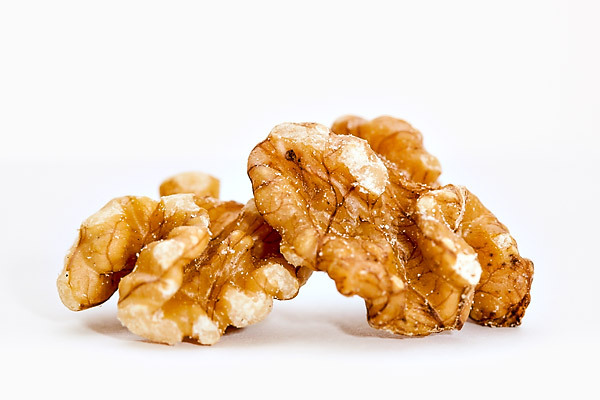 Have you ever tried erasing scuffs and scratches with walnut meat? This entry was posted in Cleaning, DIY Green Ideas and tagged better for the earth, better for you, easy, saves money, saves time, walnuts. Bookmark the permalink. 16 Responses to Repairing Scratched Hardwood Floors with Walnuts Review — Does it Work? I hope I don’t have the opportunity to try this, but I am sure that I will! Thanks for the info 🙂 New follower from Simple Lives blog hop! Thanks for stopping by Jen! For your sake, I hope you don’t either! I have a pre-oiled cumaru floor that I bought from Costco. I simply apply oil to a cloth and rub it on a scratch. I’m sure you can use walnut oil or any oil at all for this technique! Btw, this post is awesome! I’ve never heard of using walnuts on hardwood floors. We are moving into an apartment with hardwood floors in a couple weeks so it’s great to learn this tip! I’m going to buy some walnuts. Three kids and a dog and all hardwood floors… need I say more? I hear you Kristin! Thanks for stopping by! Thanks Eise! My husband is a wonderful photographer, and does all the shots for Green Idea Reviews. When I was younger I played the viola quite a bit. We’d often use nuts to help with the tiny nicks and scratches that occur on the delicate instruments.